I’m about to tell a “back when I was a kid…” story. Because I’m turning 30 later this summer, and that makes me old. Depending on where you are in your life’s journey, you may or may not agree with that statement. Wait, that’s not right. We drove to Sac on I-5 and looked at cool horses and the latest horse products. We also watched a man named Ga-Wa-Ni Pony Boy give a presentation. Does anyone remember him? He was a Native American gentleman who taught about developing a relationship with your horse before it was super-commercialized and overdone. The main lesson I remember from way back then is the importance of observing your horse’s behavior in his natural setting. The great thing about this is that no special equipment or membership dues must be purchased. Just simply go out to the horse pasture or pen or wherever you keep your horse, get comfy, and watch. You’ll learn about your horse’s individual habits and personality, things that are useful to know as you’re riding or training him. Is he dominant or subordinate to the other horses? Is he lazy or always on the alert? Is he clumsy or naturally sure-footed? This the Spanish Ranch cavvy turned out in the horse pasture at the Dry Creek camp. 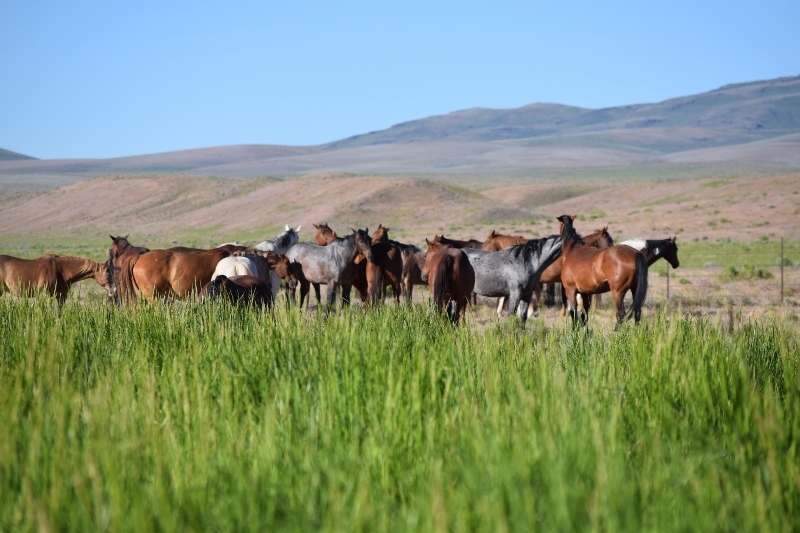 Notice how some horses are dozing in the sun, some are interacting with each other, some are looking off into the distance, and some are grazing. These two are scratching each others’ withers. Have you ever scratched a horse until he felt so good he made his upper lip really stiff and scratched your shoulders? Horses are buddies and help each other out. 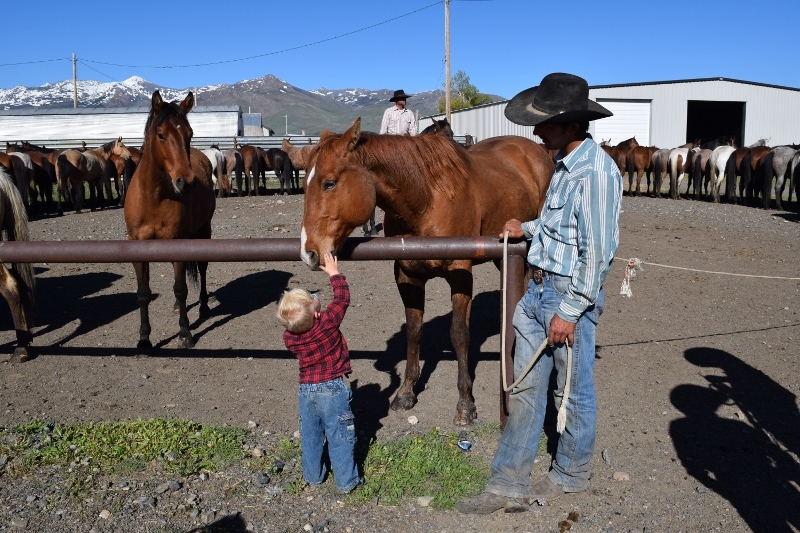 Our horses run in a cavvy, or group of saddle horses on a ranch. They’ve lived in several cavvies throughout my husband’s cowboy career, and they always stick together in their own little pack within the cavvy. 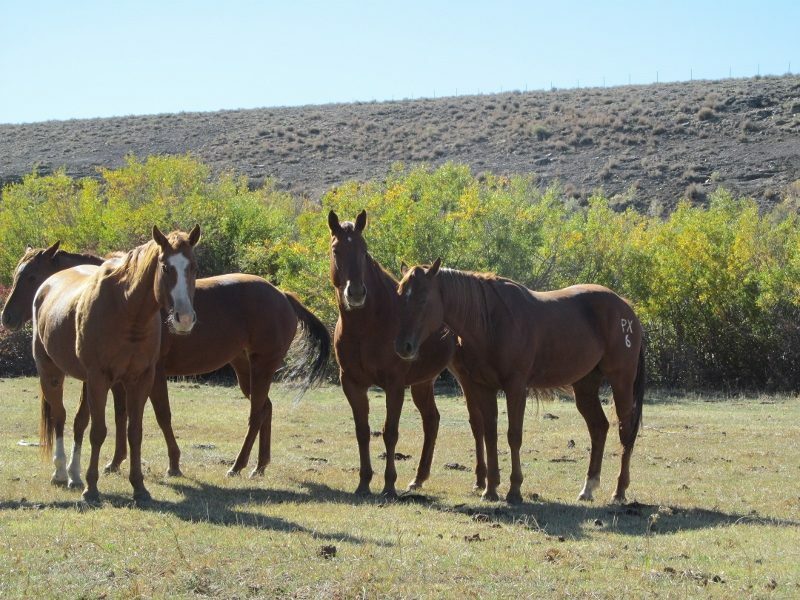 Bob is the bald-faced horse on the left, and Teaks is the sorrel with the PX on his hip. The other two in this picture are a couple of mares that buddied up with our geldings. This picture was taken a few years ago at the Diamond A, where they ran a mixed cavvy of mares and geldings. 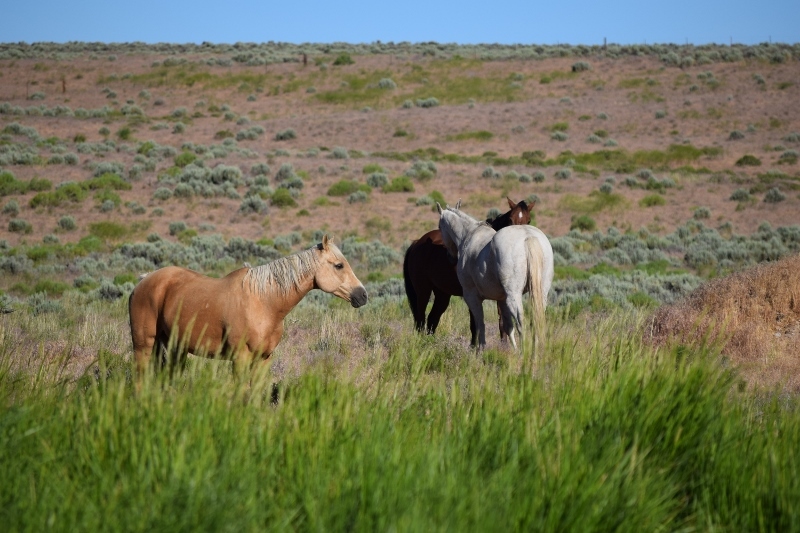 That is unusual, as most ranches run only geldings or two separate cavvies. The type of horses (geldings or mares) in a cavvy affects their natural herd behavior as well. Here at the Span, the cavvy is wrangled into a set of ropes every afternoon so that horses for the next day’s work can be roped out and put into a night lot. The horses often stand in the same spot on the ropes each day. This sorrel gelding, Smoochie, always stands right by the gate and gets petted by whoever is standing there. His favorite are the little kids. What is your horse like in his natural setting? Does he stand in the same corner each afternoon and swish flies? Does he have a certain time of day that he drinks? Does he eat all his hay at once or does he work on it over a longer period of time? Spending some time observing him in his natural setting can answer these questions and more.